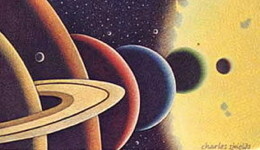 Planetary Alignment Decreases Gravity (1976) During an interview on BBC Radio 2, astronomer Patrick Moore revealed that at exactly 9:47 a.m. Pluto would pass behind Jupiter, and that this alignment would result in a stronger gravitational pull from Jupiter, counteracting the Earth's own gravity and making people momentarily weigh less. He told listeners that if they jumped up and down while this was happening, they would experience a strange floating sensation. When 9:47 a.m. arrived, BBC2 began to receive hundreds of calls from listeners who claimed to have felt the sensation. One woman insisted that she and her friends had floated around the room. Another caller complained that he ascended so rapidly that he hit his head on the ceiling. 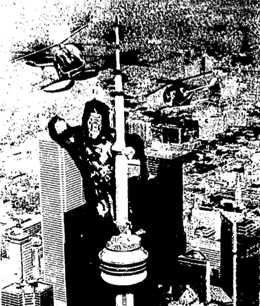 King Kong Climbs CN Tower (1976) The Toronto Star printed on its front page a picture of King Kong hanging from the top of the CN Tower, which at the time was nearing completion. (It opened to the public in June 1976.) In a nod to the original movie, Carmen Nigro, who claimed to have played King Kong in the 1933 film (although a rubber model was used in most shots) was inside the ape costume. Pennsylvania Capitol Building Collapses (1976) The Patriot (Harrisburg, Pennsylvania) published a photograph of the state capitol building collapsing. A caption below the picture read, “Custodian A.F. Day said the blast occurred during a joint House-Senate session addressed by Hubert Humphrey and Gov. Milton Shapp… Day attributed the explosion to an abnormal expansion of hot air which usually is absorbed by acoustic seats in the chamber.“ The hoax elicited negative comments from many readers who accused the paper of “confusing fun with irresponsibility.“ Two days later the paper apologized for the hoax and promised that it would never publish another. The hoax recalled a similar April Fool’s Day joke published by the Madison Capital-Times in 1933. This month in the hills of New Hampshire, we discovered an example of computer technology in the form of the first practical Touring Machine, shown here complete with a unary relocatable based operator (in IBM OS PL/1 parlance). For those individuals having less than a passing acquaintance with computer science, the Turing machine is a famous mathematical construction first formulated some decades ago by Alan Mathison Turing, and which can be shown to be logically equivalent to any digital computer implementation. A Turing Machine is to computing what a Carnot cycle is to thermodynamics. 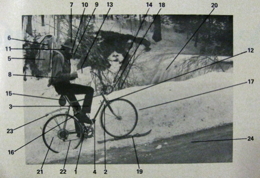 (The fact that this particular Touring Machine implementation looks like a CarNot Cycle is purely incidental.) But Turing machines have been notoriously impractical in terms of everyday computer usage until this new product rolled into town. This newly released virtual Touring Machine, version 27 chain level 1, incorporates numerous state of the art features which make it one of the better examples of the form.